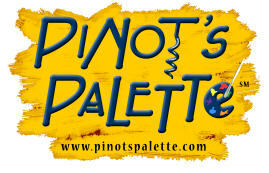 Pinot's Palette (formerly Pinot & Picasso) first opened for business on May 6, 2009. Being a new concept to Houston, we started small, with the hopes of having class three nights a week. Before long, word of mouth spread of our new “fun night out” and we now have two fun locations & are accepting applications for franchises! Less than a year into operations, we made the tough decision to change our name. Research revealed that there was potential for legal issues with using the Picasso name, so before growing our business any bigger we decided to play it safe & make the change. We polled our customers for input (& received over 2,000 suggestions) and have come to be called Pinot's Palette officially since May 2010. Much has changed since we first opened our doors, but the one thing that hasn't changed is our mission - our goal is to bring fine art to the masses in a fun way, and to teach our painters the magic to create their own masterpieces! So come --- Paint. Drink. Have Fun. with us!